Lácteos Martínez was founded in 1961 by the second-generation, husband-and-wife cheesemaking team of Jesús Martínez and Justi González, whose parents made cheese at home for personal consumption. The creamery is located in Haro, in La Rioja, Spain, a region known primarily for its dry, red wines, as well as vegetables, cured meats, and cheeses. Still family owned and operated by the four Martínez children, Queso Los Cameros, whose affirmation is cheese and family are our way of life, is committed to crafting artisanal cheeses from traditional recipes using high-quality raw milk from community farms no further than 120 kilometers away from the creamery. Should you find yourself in the area, Queso Los Cameros offers guided tours on Fridays at 10:00 a.m. and Saturdays at 10:30 a.m. The tours are approximately one and a half hours in length and conclude with a cheese tasting. Their mission is simple: to help you to toast for a better life, a life made of good things done with care. 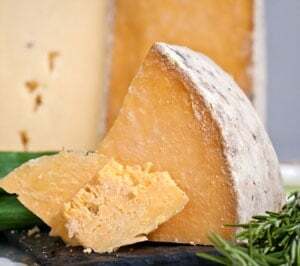 The award-winning Los Cameros Red Label is a mixed-milk, pasteurized cheese made from a minimum 60% cow’s milk, 20% sheep’s milk, 6% goat’s milk, and sheep’s rennet, with minimum whey drainage through a cotton cloth. 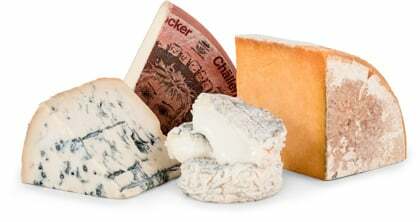 French-style affinage mold is allowed to grow on the surface, and during the 6-month cellar aging process, olive oil is brushed and rubbed on the cheese. The mold releases enzymes and combines with the olive oil, which creates a beautiful rind and a unique, herbaceous flavor profile. The olive oil, with its anti-mold properties, also protects the paste inside from the mold. This World Cheese Awards Super Gold winning cheese is clean and well balanced. The pale-yellow paste exhibits pungent peppery notes, vegetal flavors, and pleasant acidity. The finish is long and especially delicious, reminiscent of savory bay leaves. It naturally pairs with red wines made from the indigenous grapes of La Rioja – Tempranillo, Garnacha, Graciano, and Mazuelo. Los Cameros Red Label is traditionally paired with Dulce de Membrillo, a popular Spanish paste made from quince, as well as the region’s cured meats.